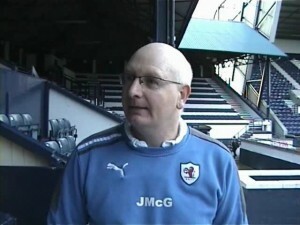 Heart of Midlothian FC have today announced the appointment of John McGlynn as their manager. Everyone at Stark’s Park wishes to place on record our sincere thanks to John for his professionalism and integrity, for his total commitment to Raith Rovers during his 5 1/2 years with the club, and for the significant successes achieved under his leadership. Having taken over the reins in November 2006 when the team was languishing in the lower reaches of the Second Division, promotion was achieved, we reached the cup semi final for the first time in 60 years, and we came within a whisker of further promotion to the SPL in 2011. Possibly of even more long term significance, however, was the creation of a sustainable football operations infrastructure. John now moves on to pastures new, and our loss is undoubtedly Hearts’ gain. We wish him all the very best in his future career. With the start of the new football season only a month away, and pre season training already under way, Paul Smith will take interim charge of these crucial preparations. The board has already met to consider who we would like to take the club forward from here. No further comment will be made until we are able to confirm the new management.